Peruvian archaeologist Quirino Olivera has found thousands of 6,000-year-old cave paintings in the Amazon jungle in the Andes. 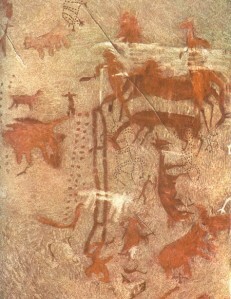 They’ve been researching the area for the past two years and had found over 6,000 Stone Age cave painting already. Now they’ve found 10,000 more. 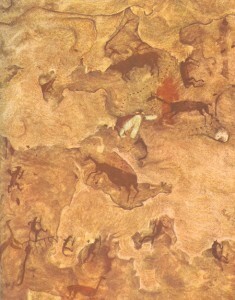 According to Olivera, most of the Tambolic paintings depict hunting scenes and are similar to those found in Toquepala. The artists used mainly red, brown, yellow and black pigments. The Toquepala caves are located in the western Andes, at an altitude of 2,700 meters above sea level. They are noted for cave paintings depicting scenes of hunters corralling and killing a group of guanacos, a camelid animal native to South America. Known as “chaco” in the Peruvian Andes, this hunting technique consists of forming human circles, to corral the animals and either capture or kill them. This entry was posted on Tuesday, March 17th, 2009 at 11:45 PM	and is filed under Ancient, Treasures. You can follow any responses to this entry through the RSS 2.0 feed. You can skip to the end and leave a response. Pinging is currently not allowed. He sounds it. Do you know him personally?